Ever want to VJ and perform a live music set all from one app? Back in July of 2015 I received Takete from the creator Refined Stochastic Technology. 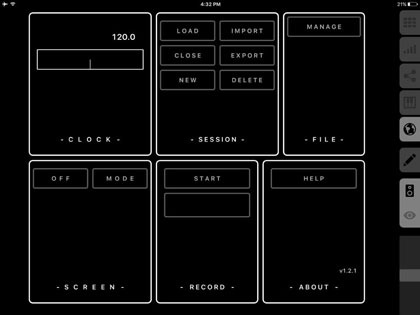 Takete is a VJ and Groovebox app For iPad and to be honest I instantly bonded with it which is a good thing because one must be determined to learn their way around this app. It did take me a bit to wrap my mind around operating it but once I did I had lots of fun. Problem is I’m still on an iPad 3 so it didn’t run smoothly the whole time. The app is recommended for iPad Air 1 or equivalent. Takete gives you four audio instruments to use in a mix as well as a live audio input PLUS flexible effects busses for each. 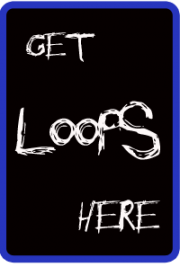 It also features a separate VJ section for triggering and manipulating video loops. 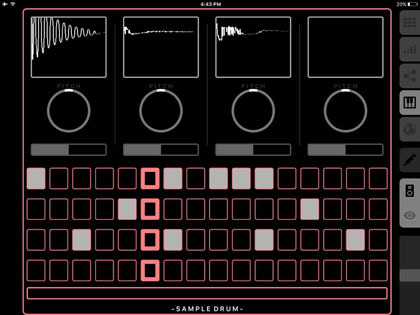 You can sequence the drum samples and granular synth in a step pattern style sequencer. You’re limited to certain number of steps though hopefully some day this will get updated. This app is quite deep and I am merely scratching the surface here with this review but I plan to compose a much more in depth review soon as well as some tutorials. STAY TUNED. File Player is just that. It plays a file like a one shot sample. You can set it to trigger or loop. 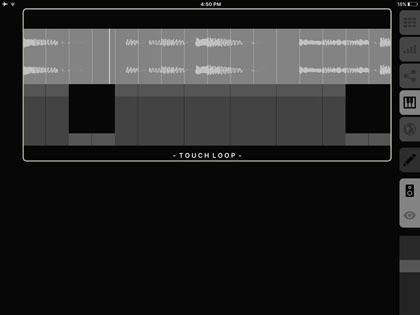 Touch Loop is a way of looping a sound file and triggering sections of the waveform similar to how a gate operates and it all occurs in a linear fashion while staying in sync with the project tempo. 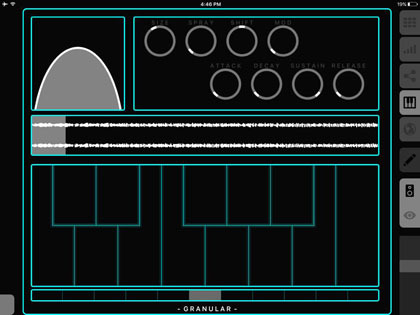 As for the Granular Synth I think we all know what that is but just in case the granular synth allows you to select a small bit of the waveform and loop it to create a playable synth patch. You can play on the keyboard controller as well as sequence notes with the matrix controller. There is no way to record your keyboard controller performance into the matrix they are separate. Drum Sampler is a four pad drum player. 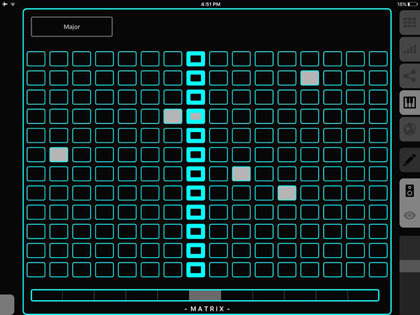 You can tap the pads and use the matrix controller to sequence your beat pattern. Here is something I know you’ll appreciate. 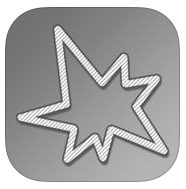 You can record your video and audio output and then access it through iTunes. There’s a button in the global section. Currently it records both video and audio simultaneously. You can copy the files from the documents folder in iTunes and then open it with any software on your computer.There is a lot of potential for this app and I must admit it is quite addictive. Plug the video out to a projector and you’ll be set up to perform a cool visual audio experience. You can import videos from your camera roll which is convenient and the video effects and video mixer are quite nice. You can trigger video dissolves and effects from sounds and the video responds to the audio as well. Takete comes with a pretty hefty price tag as it sells for $79.99 but there is also a light version available for free. Takete Lite contains the functionality of Takete but with limited editing and saving disabled. The video below was my second day with the app. I shot the video with my iPhone so forgive me for not getting a direct audio feed. 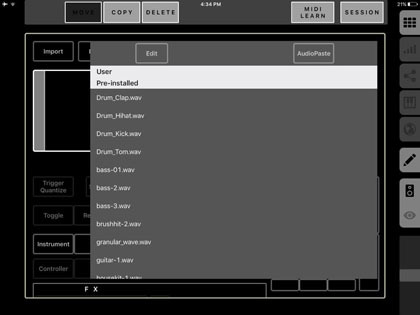 FROM THE DEV: “Takete is an advanced audio visual performer featuring a unique set of tools for musicians and artists. Based on the phenomenon of synesthesia, Takete offers fine control between audio and visual elements to create immersive and tightly integrated AV works.